I have been waiting excitedly for this book since I finished The Daughter of Smoke and Bone. This book was beautifully written and spends a huge amount of time getting deep into the story that was started in book one. 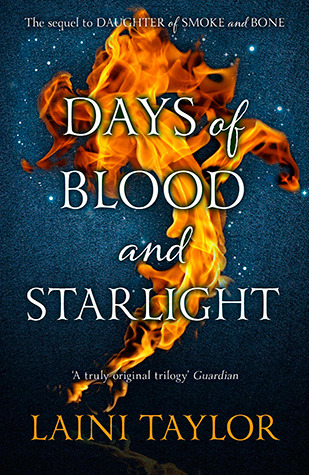 It focuses on switching between looking at the two sides of the ongoing war between the angels and the chimaera and gives the reader a real insight into the two different worlds and the pressures they face. However for me this book really suffers from being a middle book in the series and I going that I was losing interest regularly despite how beautifully it had been written because I just felt that everything was being set up for a final book but that in fact very little was happening. It seemed to me to be a lot of angels plotting in one camp and karou stuck in another camp making working her bottom off to reanimate her people whilst being treated like the enemy by the rest of the people in her camp. I think the problem for me is I really enjoyed the relationships in book one but in this book they weren't really there. So am I still looking forward to book three? Yes but with not the enthusiasm I had before but I'm still hopeful that the series will be as brilliant as I have hoped it will be. I have this one on my pile to be read, it's a shame it's suffered from middle-book-itus though!